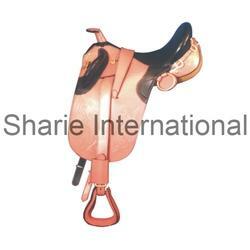 Prestigious clients can avail from us precision designed assortment of Stock Saddles, which provide superior fastening to the back of the animal. Made using finest grade leather and other material, these are offered in beautiful designs so as to provide high pleasure of horse riding. Moreover, use of quality material along with advanced techniques in manufacturing ensures the durability, reliability, excellent finish and other characteristics of the range. Following industry standards and changing trend, we design and manufacture our range of Leather Stock Saddle in various patterns, sizes and colors to meet the diverse preferences of the clients. Moreover, to keep the quality at its best and offer flawless products, the complete range of Saddle is manufactured using only excellent grade leather and sophisticated techniques. Size: 15", 16", 17", 18"
Backed by a team of expert professionals and modern manufacturing facilities, we have been able to offer to our clients a wide range of Stock Saddle. Stringently supervised by our professionals, these saddles are carefully manufactured using finest grade leather, sourced from leading vendors of the market. Together with the support of our professionals and high production rate, we are capable in meeting even the bulk demands of the clients. 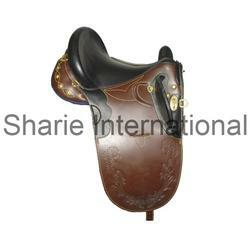 In order to meet the variegated needs and demands of the clients, we present an elegant and precision designed array of Horse Stock Saddle. Manufactured using superior grade leather, these horse saddles can be availed in various colors such as black, brown, tan and many more. Designed with precision in standard size to fit on various breed and ages horse, these can also offered in sizes like 15", 16", 17", 18" to meet the specific requirements of the clients. 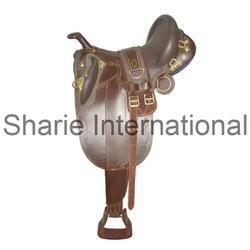 ur valued clients can avail from us a comprehensive range of light weighted and durable Horse Aussie Saddle. Designed without horn and complete accessories, these are running high in demand in the market owing to their distinctive characteristics such as intact stitch, high tear strength, elegant designs, perfect fit and flawless finish and various others. Further, to gain utmost satisfaction, we commit for optimum quality with customization, time-lied delivery and cost effective pricing. 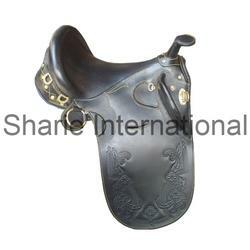 Stock saddle with horn made with High quality Of Indian leather. 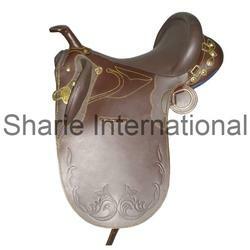 Your valued clients can avail from us a comprehensive range of light weighted and durable Horse Stock Saddle. Designed without horn and with complete accessories, these are running high in demand in the market owing to their distinctive characteristics such as intact stitch, high tear strength, elegant designs, perfect fit and flawless finish and various others. Further, to gain utmost satisfaction, we commit for optimum quality with customization, time-lied delivery and cost effective pricing. 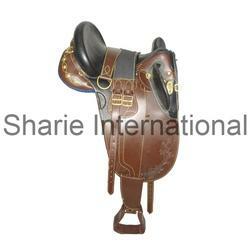 ur valued clients can avail from us a comprehensive range of light weighted and durable Horse Aussie Saddle. Designed with horn and complete accessories, these are running high in demand in the market owing to their distinctive characteristics such as intact stitch, high tear strength, elegant designs, perfect fit and flawless finish and various others. Further, to gain utmost satisfaction, we commit for optimum quality with customization, time-lied delivery and cost effective pricing. 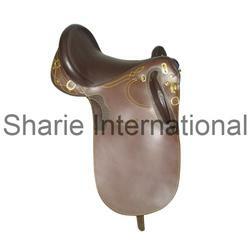 Our valued clients can avail from us a comprehensive range of light weighted and durable Stock Riding Saddle. Designed with horn and complete accessories, these Stock Saddle are running high in demand in the market owing to their distinctive characteristics such as intact stitch, high tear strength, elegant designs, perfect fit and flawless finish and various others. Further, to gain utmost satisfaction, we commit for optimum quality with customization, time-lied delivery and cost effective pricing. Following industry standards and changing trend, we design and manufacture our range of Australian Saddle in various patterns, sizes and colors to meet the diverse preferences of the clients. Moreover, to keep the quality at its best and offer flawless products, the complete range of Australian Saddle is manufactured using only excellent grade leather and sophisticated techniques. 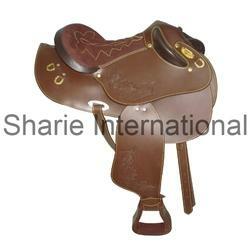 Looking for Stock Saddles ?